(TAIPEI, TAIWAN, 07.16, 2010) Taiwan Commate Computer Inc.(COMMELL), announced its latest addition to the family of 3.5" Embedded Miniboard ---- LE-376. The embeded 3.5" miniboard based on the Intel Atom processor single core N450 & D410/ dual core D510, implemented in 45nm technology, is power-optimized and delivers robust performance-per-watt for cost-effective embedded solutions, the N450 TDP rating is only 5.5Watts / D410 is 10W and D510 dual core is still only 13W. Low power and integrated graphics/video makes this platform well suited for many embedded market segments such as in-vehicle infotainment, industrial control and automation, gaming, diagnotic and therapeutic medical devices, media phones, and retail and transation solutions. 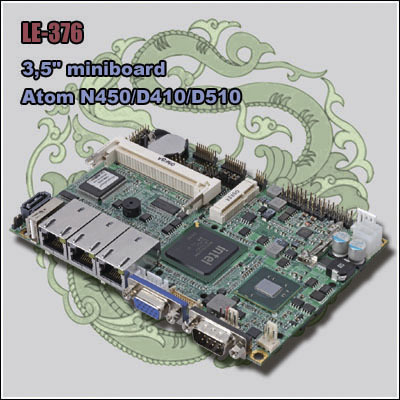 The LE-376 Embedded miniboard consists of the intel ATOM N450/D410/D510 and ICH8M, Graphic Processing Unit features power-efficient 32-bit 3D graphics core based on Intel GMA 3150 architecture, video capability with up to 384MB of shared graphics memeory, delivers sophisticated graphics for large display applications and with Dual display types such as VGA+LVDS, Enables smoother playback for MPEG-2 codec, a standard video compression format used on Blu-ray, DVDs, broadcast, and broadband content. COMMELL's LE-376 supports DDR2 SO-DIMM up to 2GB(N450) or 4GB(D410/D510), and comes with PS/2 Keyboard and Mouse, 5x RS232C and 1 x RS232/422/485, 3 x Intel 82583V Giga LAN, 5 x USB2.0 ports, It offers Realtek ALC888 HD audio, two SATAII interface, CompactFlash Socket, LPT, SMBUS, DIO, one PCIE mini card socket, one Mini PCI socket, DC 9~24V input. CPU: Intel Atom N450/D410 single core/D510 dual core processor 1.66GHz. Memory: 1 x DDR2 SO-DIMM up to 2.0GB or 4GB. VGA Interface: Intel integrated extreme GMA 3150 technology. LAN Interface: 3 x Intel 82583V Giga LAN. LVDS: Onboard 18-bit single channel LVDS. Serial ATA: Support two SATAII interface with 300MB/s transfer rate. Audio: Integrated with Realtek ALC888 HD Audio. I/O Ports: 5x RS232 and 1 x RS232/422/485 serial Ports, 5 x USB2.0 ports, 1 x PS/2 keyboard and mouse ports, 1 x LPT. Extended Interface: One PCIE mini card socket, 1 x Mini PCI socket.